Today I received the first order for A Life With Horses. The book is not available yet, but how wonderful to get that first order...and how frightening! It's one thing to write a book about one's life; it's quite another to publish it for all to read! Some may criticize my writing style; some may question the content; some may just not like the book. But, though criticism is not pleasant, that is not what frightens me. When A Life With Horses circulates, a significant piece of me goes with it. If I had started this blog when I started writing A Life With Horses, (I should have!) the posts would have been saturated with emotion. It was not always an easy ride. Though I never intended the content to be sad, some memories were painful and I cried many tears - every time I re-read the passages! Some are funny too, or emotional. I realized (and ultimately submitted to) the fact that my personality, values, and innermost thoughts had crept into the pages. 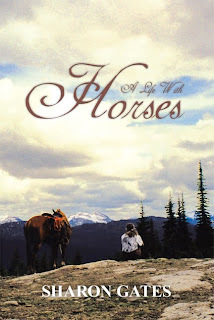 What began as a collection of stories about horses in my life became also a story of my life with horses and the story was impossible to tell if I didn't reveal myself. So be it. It is what it is now. OK. There was definitely a learning curve to the process of publishing a book. If I ever thought writing the book was end of all the work, I stand corrected. Also working long distance with the publishing company presents a whole new set of challenges. First of all, I had to come the terms with the fact that I would never be done editing. Every time I read it, I could change something. I had to put the book to bed. The next issue was the cover. I wanted it to whisper a hint of the content of the book and still attract readers. After a lot of time on the computer and several phone calls and emails, I settled on a photo I took myself with the aid of a tripod and timer. I have finally approved the cover for A Life With Horses and I like it! Now the real work begins - letting the public know about A Life With Horses. Ridin', Reinin' and Writin' is one of the first ways I am doing that. It is also an outlet for the writer in me and a cool tool to keep in touch. Talk later.